There is a pervasive idea in business that meetings are crucial to making decisions. This has become so ingrained that we can’t imagine our workdays without meetings, even if we hate the time, energy, and resources lost. In truth, most meetings are unnecessary. And the ones that are necessary are tedious and ineffective. To improve efficiency in your business you must address the issues of meetings – when to have them and how to have them effectively. Meetings do have their place in business. Some issues require decisions with big consequence, and that’s where meetings come in. But even with larger decisions, you can’t jump right into your typical meeting. 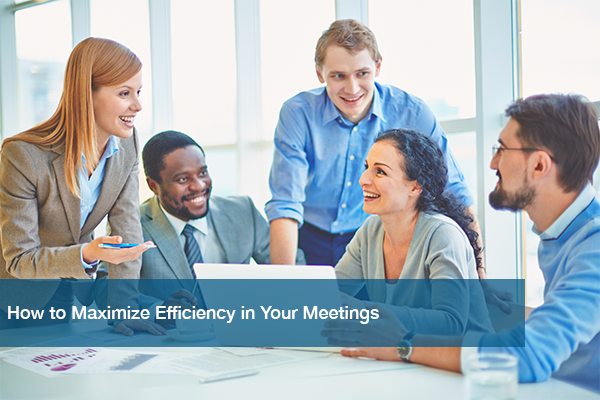 There are changes needed to improve every meeting’s efficiency. This applies to both the facilitator and the attendees. As a facilitator, you should have your own solution ready. Consult with others before the meeting, through email or one-on-one to get their feedback on the issue and use those ideas to create this decision, but don’t get attached. Make sure the attendees have the information they need, including the issue itself, beforehand. If you’re an attendee, go over and understand these items before the meeting starts. Anyone who attends a meeting unprepared is a setback. Have no tolerance for setbacks. This applies to time and people. Invite only those you need. Set a duration for the meeting beforehand and commit. At the end of the meeting, make a decision. If there is no lenience for running over that time limit, you’ll find your meetings becoming more effective. This applies to higher profile decisions. While we typically try to avoid conflict, encouraging it in a meeting can yield a stronger, more successful decision. Ask the attendees about the agreed-upon decision’s weak points and go from there. This will leave you with a better decision that stands up to questioning and critique. An action plan is the product of a meeting. Create one at the end to implement the decision made. Ensure it’s clear and includes who is responsible for what and when it is to be completed. It’s the facilitator’s job to follow-up and see that everyone who agreed to complete a task does so. When an issues lands in someone’s lap, it’s their responsibility. This applies to everyone in a business. If it’s a minor item of no real consequence, then they should make the decision themselves. No meeting required. Meetings are often used as message boards. Everyone gets together to hear information or updates. Information is better suited for emails or instant messages. Meetings should be used to settle on decisions and initiate action. If you need an instant messenger for this purpose, check out our article, 3 Ways Your Team Can Improve Communication Today for our recommendations. This comes with a commitment from all parties. Everyone must agree to read and stay updated on messages to prevent falling back into these time-wasting meetings. They must also agree not to abuse this. Keep communication clear and concise to make it easy for everyone to stay on the same page. You don’t have to stop holding meetings. You just need to be smarter about the ones you hold. When held too often, meetings become the scourge of the office. They’re time-consuming, tedious, and they don’t accomplish anything. They’re a waste of everyone’s time, and time is money. For more on efficient time management, read our post, The ABC’s to Time Management: Getting More Done. Once your company makes these changes, you’ll see a marked improvement in the efficiency of your meetings. Meetings stop being a time-sink, and your business can get back to work. Everyone wins. For more tips you can check out Forbes’ article on five simple steps to more effective meetings. If you’re looking to get IT issues off your plate to focus on your business, call ITC today at 512-348-8324. We exist to help you do just that. Get your 100% free, no commitment quote today and see why so many Austin small businesses trust ITC to handle their IT needs.